What is throw statement in C#? What is the functionality of throw statement? How to use throw statement C sharp programming? Throw statement is used for throwing exception in a program. The throwing exception is handled by catch block. 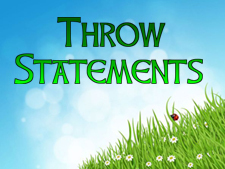 You will learn complete about throw statement in Exception handling tutorial. When you will execute this code, and input 0 for second input then you will get the Can’t Divide by Zero Exception that is raised by throw statements. In this chapter you learned what throw statement is in C# and how to use it in programming. In next chapter you will learn Checked Statement in C#.